We saw more about Lambda Expression in our Part 1 of this series .Wonder how those were compiled or how those expressions parsed? To do so, we need to get into Expression Trees! Expression trees are nothing but those which represent the query itself. And now we have a small function which is going to take an expression as its parameter and return the value for which the expression is queried for. That’s a bit confusing! Whats happening ? Now we have extracted our BinaryExpression body which has a Left property and Right property, as shown above in the diagram. What if we need to manually build Expressions? We just use the technique of how we parsed to build the expression manually. 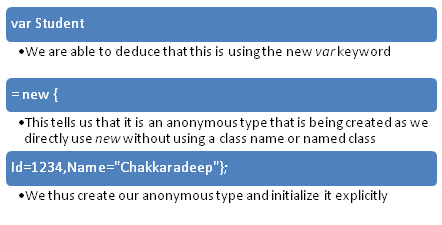 3: //right property’s value "Chakkaradeep"
8: //construct our BinaryExpression which is x.Name=="Chakkaradeep"
We come across this new keyword called var when we use LINQ, what does this var keyword do? That’s really confusing! – What are these anonymous types? To understand the var keyword, we need to understand what really anonymous types are, and to understand anonymous types we need to know about var keyword, lol! Both go hand in hand. So we can come to a conclusion that the var keyword deduces the data type of an object with the initialization of that object. When you compile the above code, it fails because the object FullName is initialized as a String and we are trying to assign an Integer value to it! That certainly looks easier and neat! Wouldn’t it be really nice and useful to provide something like this? That’s what Extension Methods allows us to do! What are we actually doing in our above code block? So, how are these done? Where are these used? 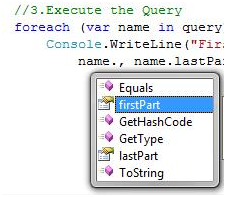 Remember our Standard Query Operators in LINQ? A partial method has its signature defined in a partial type and its implementation defined in another part of the type. This sounds very similar to Partial Class. Yes, partial methods always reside inside partial classes so that they can be used in another part of the type. Now, what happens if we do something like this? We now see that our partial method too gets called as we have implemented it! Well, there is lot of arguments going on in the community that why do we need Partial Methods when this can be achieved in many other ways. Partial methods are mostly used in design tools for use with auto-generated code. If you want to make use of those methods, you could write your own implementation and it’s going to be used, else the compiler just doesn’t execute them and moves on. Partial Methods are heavily used by LINQ-to-SQL designer tools and that’s the reason I wanted to explain about them here. · Partial method declarations must begin with the contextual keyword partial and the method must return void. · Partial methods can have ref but not out parameters. · Partial methods are implicitly private, and therefore they cannot be virtual. · Partial methods cannot be extern, because the presence of the body determines whether they are defining or implementing. · Partial methods can have static and unsafe modifiers. · Partial methods can be generic. Constraints are put on the defining partial method declaration, and may optionally be repeated on the implementing one. Parameter and type parameter names do not have to be the same in the implementing declaration as in the defining one. · You cannot make a delegate to a partial method. Lambda Expression is an anonymous function that can contain an expression or statement or can also be used to create a delegate. We are going to create a sample application which is going to filter names that contains a character. It’s a very basic and simple example, but it’s really good to explain the things that we want to explore. We would be seeing on how we approach the same concept using Named Methods and Anonymous Methods and then come to Lambda Expressions. 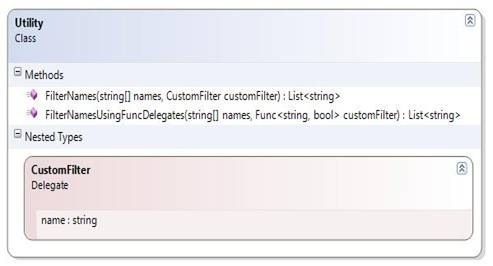 It has got two static methods and a delegate called CustomFilter with an input parameter as string and bool as return type. So, the idea is to allow the developer or user to write their own custom filter function, but use this Utility to filter. This is done with the help of delegates. It’s fairly simple and straight forward. Now we really have something useful which makes use of Named Methods. This sample will help the Customer who is going to use our Utility to write his own Filter and use the generic FilterNames function to filter it. Look into our filter method which is Myfilter – It’s fairly simple, just checking whether the name contains a character and returns true if so. Do we really need to write a method for this? Why can’t we specify a code block instead and make use of it? Anonymous Methods comes to our rescue! Anonymous methods can be used to pass a code block to a delegate, using the delegate parameter, and can be used in places where creating a method is really not necessary, like in our example. Note that our FilterNames Utility function remains unchanged. However, Anonymous methods do have one drawback in regard to readability. It’s more verbose and the code block sometimes becomes really hard to read! So, do we really have anything which is easy to read and also simple to use? – Yes, and Lambda Expressions comes to our rescue! Note that our FilterNames Utility function still remains unchanged. We did see that lambda expression that has an expression. What about a statement? We did see that lambda expression that has an expression, a statement. 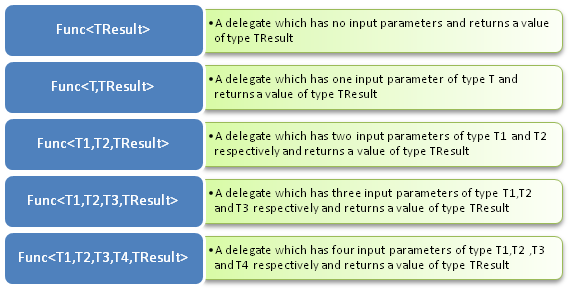 What about the last one which can be used to create a delegate? With the Func<T,TResult> family of generic delegates, we can use lambda expressions to create a delegate and invoke it. The above code block looks fairly simple and actually we see that we can eliminate Named Methods and Anonymous Methods now and directly make use of lambda expressions! Yes, you are right; we no need to declare any delegate now and make use of the available function delegates as Predicates! //right expression its value "Marlon"
//construct our BinaryExpression which is x.Name=="Marlon"